The legacy of the civil war is everywhere to be seen in Spain. All one needs to do is scratch the surface. 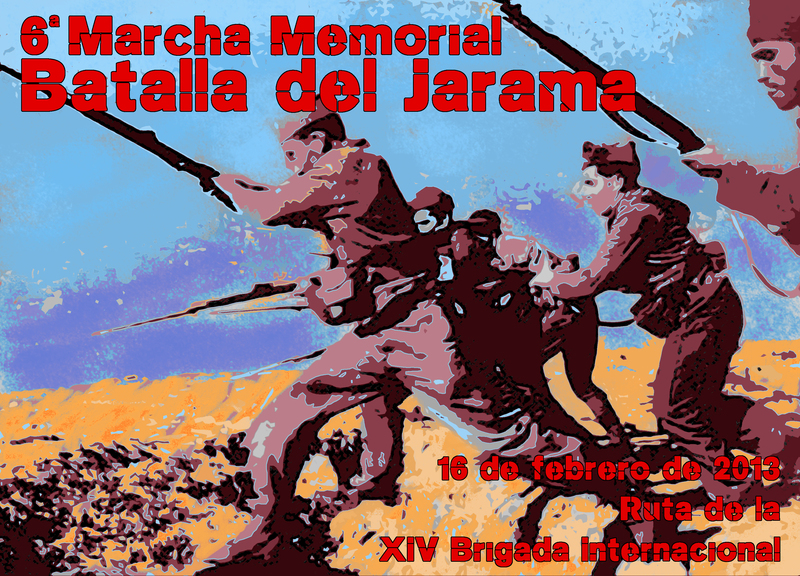 I spent the past weekend in Madrid to attend a series of events organised by the Asociación de Amigos de las Brigadas Internacionales (AABI – Friends of the International Brigades) around the battle of Jarama in February 1937. Staying in a pension in central Madrid, I was reminded as soon as I began speaking to the receptionist that the civil war continues to polarise contemporary Spanish society. After asking whether I was here for business or a holiday, I opted for the former, saying I was a historian researching the civil war. As soon as he pointed out to me that the church opposite had been used as an arms dump by the ‘reds’, I knew which side he supported. Nevertheless, I was curious to find out more about the local landscape and he pointed out some interesting sites to me. When he mentioned Paracuellos, we began a discussion on Santiago Carrillo, a communist and leader of the Socialist/Communist Youth who was allegedly responsible for the massacre of more than 2000 mostly right-wing prisoners when Madrid was threatened by the attack of columns of Nationalist forces in November 1936. The receptionist’s attitude was further reinforced when he said that some say Carrillo set out to start the civil war – a grand piece of historical distortion. Carrillo was a relatively minor player until the siege of Madrid in November, four months after the war had started. That night I attended a very moving book launch of the Spanish translation of Laurie Levinger’s book Love and Revolutionary Greetings: An Ohio Boy in the Spanish Civil War, compiled using the letters and stories home of her uncle Sam, who died aged 20 in the war. On Friday morning, I set out with two busloads of British, Irish and a sprinkling of other nationalities, for the march to identify the positions of the British and Lincoln battalions on the battlefield of Jarama. The first thing to note is that the battlefield is immense, and the positions of the British and Lincoln battalions, though important in the grand scheme of the battle, especially the British, occupy a relatively small part of the overall battlefield. On the way through the barren, rusty landscape south of Madrid, passing by bare rockfaces and olive groves, we passed to our left, the Arganda bridge. 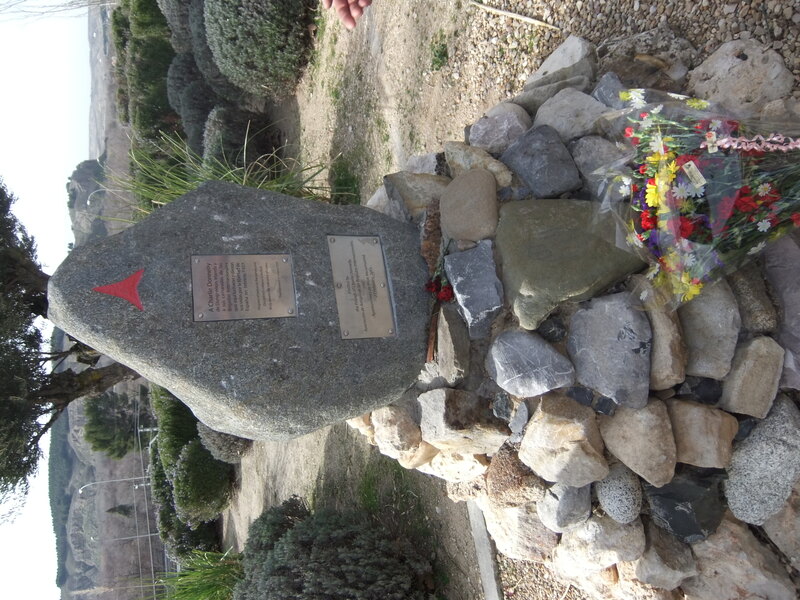 It was here that on 11 February the Francoist Nationalist columns attacked, killing the French sentries but encountering stiff resistance from the Italian Garibaldi Battalion of the XII International Brigade. 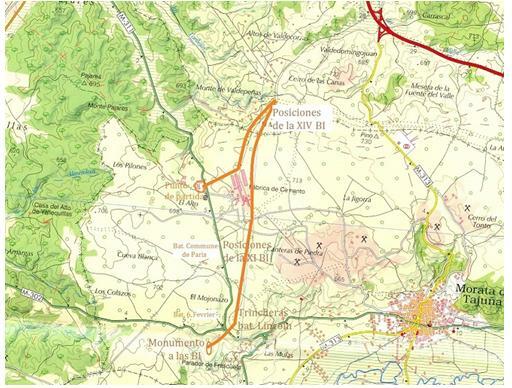 That same day, the XV International Brigade commanded by General Gal, were moved up the line, consisting of the British Battalion on the left, the Franco-Belge 6th of February Battalion in the centre and the mostly Balkan Dimitrov Battalion on the right. The Nationalist frontal attack on Madrid had been repulsed by mid-December 1936. Attacks from the north continued but were repulsed in January 1937. Franco decided to cut the city off instead. The Jarama offensive was designed to cut the Madrid – Valencia road to the south of the capital, cutting off the central government which had moved to Valencia during the siege of November 1936. The attack, which began on 6 February 1937, was meant to coincide with an Italian-led assault at Guadalajara which would surround the city completely. This action was delayed, but Franco decided to press on at Jarama regardless. The British Battalion began their campaign on the morning of 12 February at a farm building which became their cookhouse, sheltered at the rear of the battlefield. 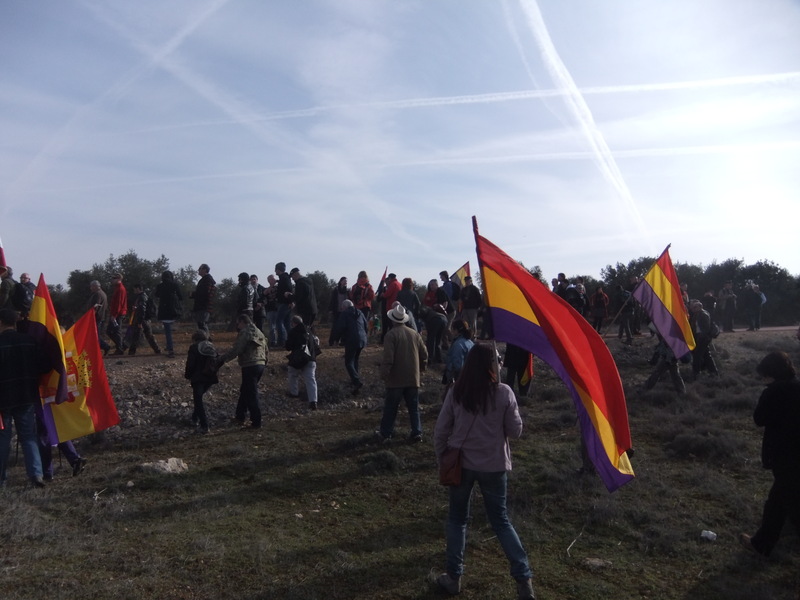 It was from here that we began our march to their positions, guided by Danny Payne of the UK-based International Brigade Memorial Trust (IBMT) and Seve Montero of the AABI. We rambled over the hilly dry landscape passing dug-outs created in a gully etched into the side of a hill. It was here that the South African sculptor Jason Gurney, who was a runner for the battalion, described finding books, clothing, ammunition and personal belongings abandoned by those who thought they would be back later to collect them. The ensuing slaughter ensured they wouldn’t. We ascended the hills to a plateau which commanded a superb view over the landscape. 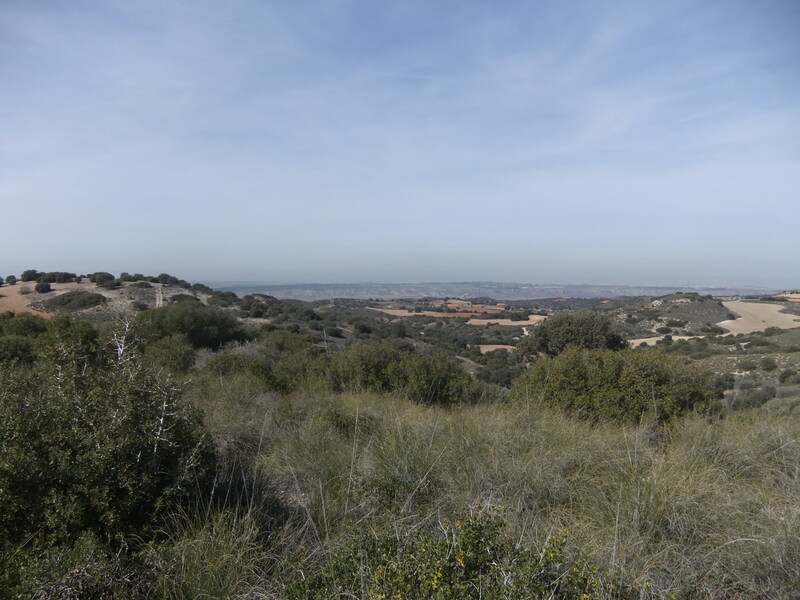 To the south, we could see in the distance the village of Morata de Tajuña, which played a key role in the battle. On the hill immediately opposite to the north on our right, we saw the area which had been the headquarters of the brigades, now marked by an imposing clasped pair of fists visible for kilometres around. View from the plateau. The monument at the International Brigade HQ is visible behind the trees on top of the ridge in the left background. The smoke rising in the centre background is from Morata. 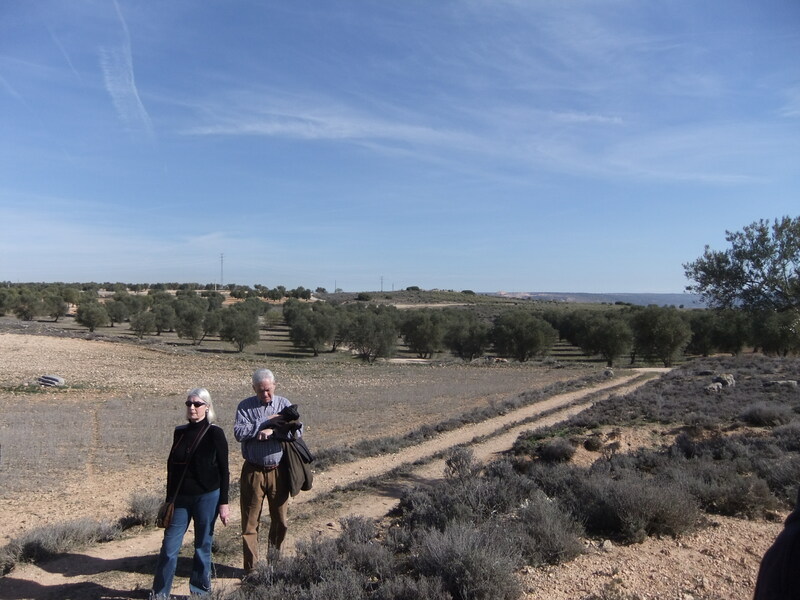 We continued our march over the plateau along a dirt track through the olive groves, passing by what became the positions of the Lincoln battalion late in February, of which more later, before reaching the area of the main fighting of the British Battalion. 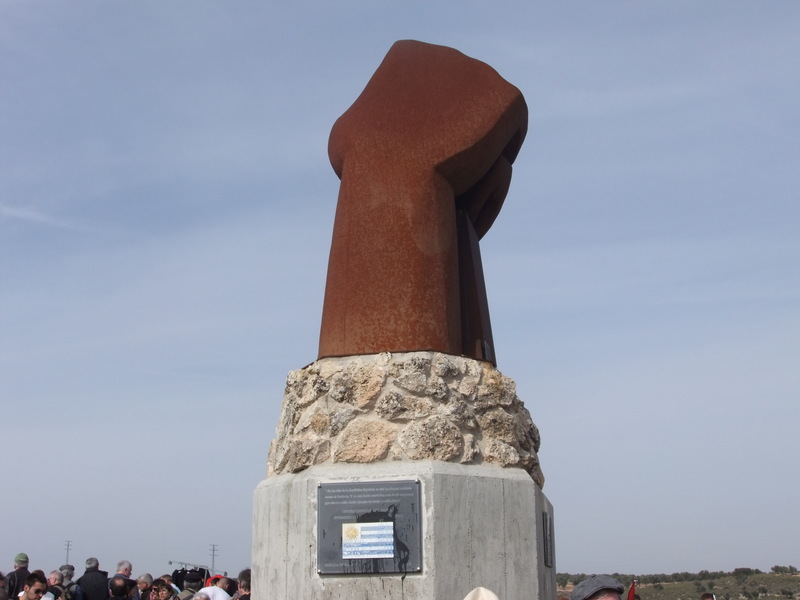 It was here that the slaughter of Jarama took place. Most of the fighters had little training, received over a period of only a few weeks at their base in Madrigueras. Some had only first fired a rifle the previous day. They had no artillery, air or tank support. Their personal supplies were not much better. The British Battalion was composed of three infantry companies of 200 soldiers each, and a machine-gun company armed with heavy maxims and a few light French Chauchet machine guns, described as useless by most eyewitnesses. These poorly-trained, poorly armed volunteers, most who had never left their homes in Britain and Ireland, were now the front line defence against a well-equipped, trained and merciless assault by Franco’s elite Moroccan regulares. Their defence initially proved a disaster. The view from the position of the machine-gun company. White House hill is visible in the left centre, with conical hill just visible slightly beyond and to its right, with the beginning of the incline of the knoll visible to the right. 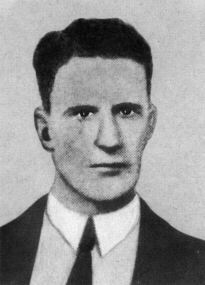 George Leeson, who was in command of a section of the machine-gun company, claimed they did not even know whether they were on the offensive or defensive. They had no maps of the area, and soon after they began to descend into the valley, they came under fire from the Nationalists, whom the Republican command had not realised had already crossed the river. James Maley from Glasgow described how as they advanced, others came running past them retreating from their positions and some of their own men started to drop, killed before they could fire a shot. They pulled back and took up positions. The machine-gun company was placed with a commanding view of the gulley and in front of it lay a ridge of land where the three infantry companies were positioned on distinctive features of the landscape. To the left was White House hill, after the white-painted building on top of it, to the centre was conical hill, and to the right lay the knoll. This whole area, but particularly the conical hill and White House hill, would soon become known as ‘Suicide Hill.’ The machine-gun company soon realised that it had been given the wrong ammunition, and so it was left to the three infantry companies to hold off the attack. Kit Conway memorial cairn located at the position of the machine-gun company. My rifle is soon burning hot. ‘Kit’ comes over. I notice his face with lanes of sweat running through the dust. He hands me a note. It is from Brigade H.Q. telling us that we must hold out at all costs. . . . Somebody calls my name. It is Pat Smith. Blood streams from his head and arm. Tom Jones of Wexford is there. Good man, Tom. Always dresses a man where he falls. A hero. He tells me Goff and Daly are hit. I reach the hill-crest where ‘Kit’ is directing fire. He is using a rifle himself and pausing every while to give instructions. Suddenly, he shouts, his rifle spins out of his hand, and he falls back. . . . His voice is broken with agony. ‘Do your best boys, hold on!’ Tears glisten in our eyes. . . . ‘Kit’ is taken away. . . . I see Fascist tanks rolling up the road to the right. The Moors are sweeping us front and flanks. We’ll never hold out now. I move to a firing-position. Suddenly, I am lifted of [sic] my feet. Something terrific has hit me in the side. I cannot breathe. . . . In the ambulance I meet ‘Kit’. He is in terrible agony, and can talk little. ‘How are the rest?’ is his constant question . . .
Next morning they told me our great leader was dead. The ridge was evacuated but just as Moroccan troops were coming over, the machine-gun company which had managed to acquire the right ammunition, opened fire: ‘You never saw a slaughter like it. They went down like corn.’ At the end of that first day, less than half the battalion remained and political commissars had to intervene to convince some to stay and hold the line. Conical Hill as viewed from White House hill. On we marched, back up the road, nearer and nearer to the front. Stragglers still in retreat down the slopes stopped in amazement, changed direction and ran to join us; men lying exhausted on the roadside jumped up, cheered, and joined the ranks. I looked back. Beneath the forest of upraised fists, what a strange band! Unshaven, unkempt; bloodstained, grimy. But, full of fight again, and marching on the road back. French soldiers joined, as did Spanish and soon they reached the ridge. Here they held the line, and from then this particular part of the front remained more or less the same for the next two years. On 16 February, the new Lincoln Battalion was sent to Jarama. 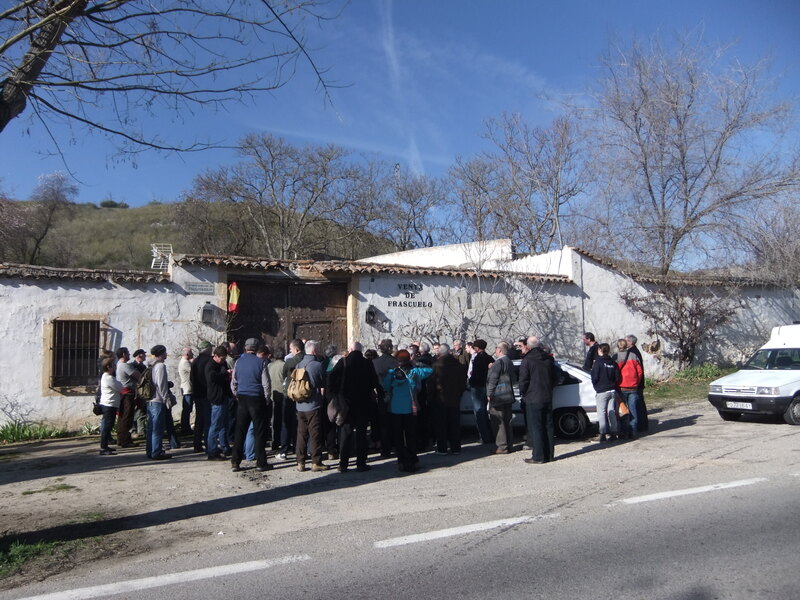 The battalion, based at the village of Villanueva de la Jara near Albacete, consisted of two companies of infantry, plus a machine-gun company, medical and kitchen staff and an armoury section, numbering 550 people in total. The Irish who had transferred from the British Battalion in January formed the ‘James Connolly Unit’, which comprised one of three sections of the first company. From the beginning, the battalion had difficulties finding an experienced and competent leadership. The role of commissar changed hands multiple times and although the battalion was officially led by Captain James Harris, he quickly proved himself inept and in practice, it would be his adjutant Robert Merriman, a 27-year-old economist, who would lead them into battle. From tree to tree into open fields, with nothing but the roots of grapevines for shelter, we now charged more rapidly, vainly seeking cover, over the soft ground heavily raked by enemy fire. We had plenty of grenades, but they were useless unless we could get close to the enemy. To make matters worse, while we were charging and approaching enemy positions, a rapid and relentless machine-gun cross fire zeroed in on us. . . . I felt so useless that I wondered out loud, at the top of my voice, ‘What am I doing here?’ But a quick glance around and I saw some of my comrades in even worse shape. A little guy to my right, whose face I couldn’t see, was frantically churning the ground with his bare hands, ripping his skin and tearing off his fingernails. Another lay behind a stump clutching his rifle and trying to shrivel himself to nothing to avoid being spotted. It was impossible to advance further. In the end, they had to retreat to their original positions. Despite twenty killed and sixty wounded, it had all been for nothing. We run for cover. Charles Donnelly, Commander of the Irish Company, is crouched behind an olive tree. He has picked up a bunch of olives from the ground and is squeezing them. I hear him say quietly, between a lull of machine-gun fire ‘Even the olives are bleeding.’ A bullet got him square in the temple a few minutes later. The order to advance had been suicidal and led to major grumblings among the troops. After this battle, the lines settled down and the brigades had to do battle with boredom and disease more than the enemy. ‘Even the olives are bleeding’. The position through which the Lincoln Battalion advanced on 27 February 1937. In total, fourteen Irish would die at Jarama from February to June 1937. Most died in the initial battles in February but there were some casualties in other minor skirmishes too. After our march over the battlefield, the Irish went to visit the memorial erected in 2010 in memory of Charlie Donnelly in Rivas Vaciamadrid, overlooking the Arganda bridge. The next day, Saturday 17 February, was the official sixth annual Jarama march, this time in memory of the French-speaking volunteers organised in the four battalions of the XIV International Brigade, and the Commune de Paris battalion of the XI IB, the André Marty of the XII IB, and the Six Fevrier of the XV IB. This march took us beyond the points occupied by the British and Lincoln battalions. My knowledge of the French positions is not as in-depth as of the XV Brigade so I cannot give an accurate account of their role in the battle. 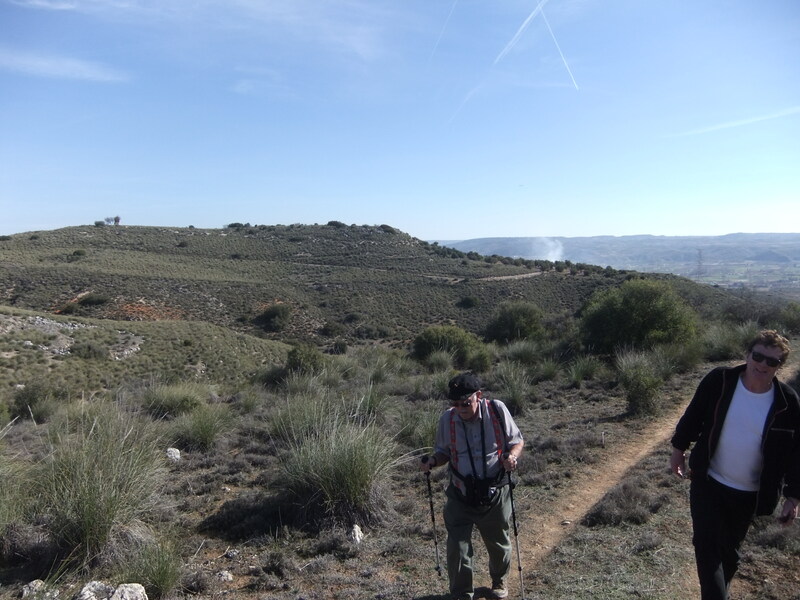 We marched to the HQ of the International Brigades visible on a ridge off to the west. When we reached the top with a commanding view of the area to the south, east and north, and the Lincolns’ position to the west it was a truly stunning sight. Deep trenches hacked into the stony ground are still visible. The towering rusty-coloured monument to the International Brigades of two clasped fists formed the backdrop in which about 300 people mingled – representatives of the IBMT from the UK, Irish representatives of the newly-formed umbrella group Friends of the International Brigades in Ireland, comprising groups which have organised memorials in Belfast, Tyrone, and Wexford, and others from Dublin, Armagh, Derry and representatives of the Limerick International Brigade Memorial Trust who are currently seeking permission to erect a memorial in Limerick. With these were members of the French Amis des Combattants en Espagne Républicaine (ACER – Friends of the Combatants in Republican Spain), a Danish man whose two uncles fought in Spain, as well as a sprinkling of Americans and multitudes of Spanish people from every left background – communists, socialists, anarchists and liberal republicans. Guests of honour were the Almudévar brothers, Joseph and Vicente, French of Spanish birth who fought in the civil war, Juan Antonio Mayoral who was a member of the Spanish Republican army during the war, and Luz Alonso, a republican of the civil war years. 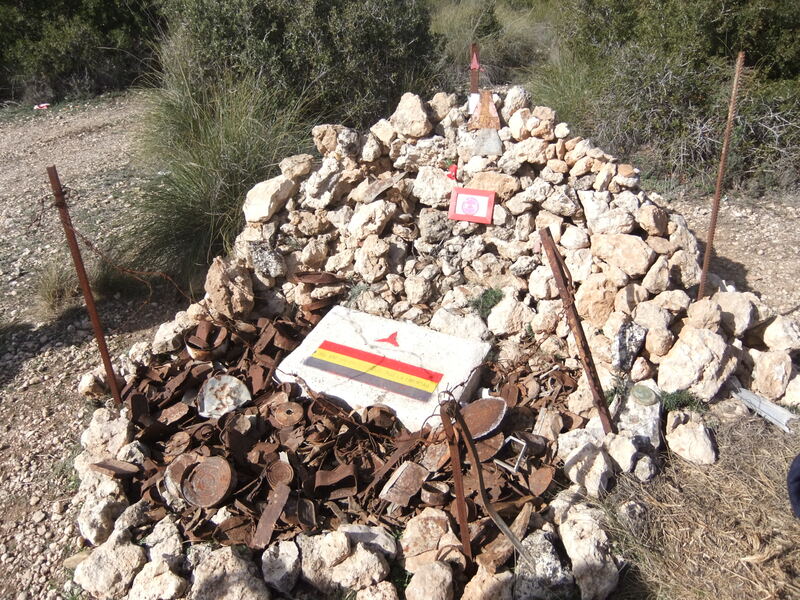 After a lunch in Morata in restaurant Mesón El Cid which is located on the site of the former field hospital of the battle, we visited the Jarama museum, which houses thousands of artefacts found strewn over the site from bullets and tin cans to medals and pieces of shrapnel. 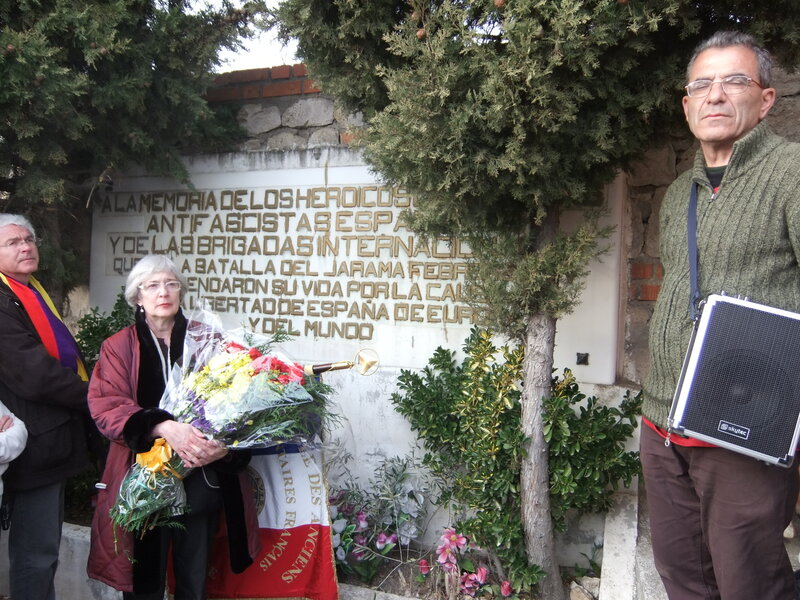 After this, we visited the cemetery at Morata, which was the site of a mass grave of Spanish republicans and International Brigaders, and of a memorial unveiled in 1994 after a campaign by International Brigaders François Mazou from France and Bob Doyle from Ireland. Claire Rol-Tanguy, daughter of Colonel Henry Rol-Tanguy, political commissar of the XIV IB, laid a bouquet of flowers in the vibrant purple, yellow and red of the Spanish Republic’s flag. Driving through the central square on the way out of Morata, we passed by the headquarters of the local fascist Falange, proudly displaying its symbol of a bundle of arrows. In some places, one doesn’t even need to scratch the surface. For a discussion of the massacre of prisoners, see Paul Preston, The Spanish Holocaust: Inquisition and Extermination in Twentieth-Century Spain (London: Harper Press, 2012), pp. 357-369. Jason Gurney, Crusade in Spain (London: Faber and Faber, 1974), pp. 103-4. Patrick Curry, Imperial War Museum Sound Archive (IWMSA) File 799/3/1. Richard Baxell, British Volunteers in the Spanish Civil War: The British Battalion in the International Brigades, 1936-1939, (2nd ed. Torfaen: Warren & Pell, 2007), p. 76. Baxell, British Volunteers, pp. 77-8. Tom Wintringham, English Captain (London: Faber and Faber, 1939), p. 170. James Prendergast, ‘How “Kit” Conway Died’, in Frank Ryan (ed. ), The Book of the XV Brigade: Records of British, American, Canadian, and Irish Volunteers in the XV International Brigade in Spain 1936-1938 (Torfaen: Warren & Pell, 2003), p. 66. Bill Alexander, British Volunteers for Liberty: Spain 1936-1939 (London: Lawrence & Wishart, 1982), p. 97, says that less than half the battalion remained, while John Bosco Jones, IWMSA 9392/6/3, says political commissars had to intervene. Baxell, British Volunteers, p. 80. It has been suggested by many who were there that the men were tricked by the Morrccans, who came up the ridge singing the Internationale, to join the side of the Republicans. The men downed arms and when the enemy arrived it was too late. This rather fanciful account is refuted by others. See Baxell, British Volunteers, pp. 81-2 for an analysis of the accounts. 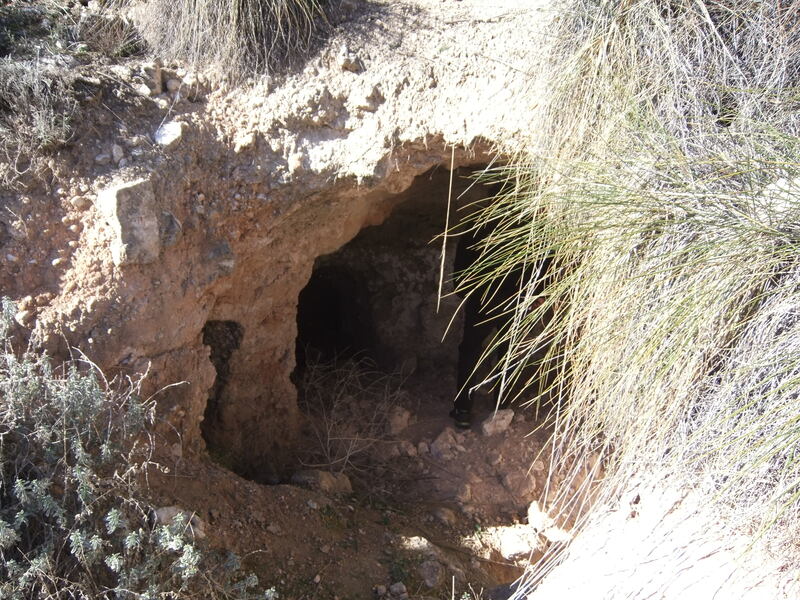 Three of those captured were shot, but the rest were taken shunted from prison to prison – San Martín de la Vega to Navalcarnero to Talavera de la Reina, where ill-fed, cold, and with poor sanitation, they were put to work, mostly on the roads. In May 1937, they were sent to Salamanca where five were sentenced to death. However, the executions were not carried out and all the men were eventually freed. See J.R. ‘Prisoners of Franco’, in Frank Ryan (ed. ), Book of XV International Brigade, p. 198-200; George Leeson IWMSA 803/4/2-3 and Baxell, British Volunteers, pp. 115-118. O.R.,‘Third Day: The Tank Attack’, in Frank Ryan (ed. ), Book of XV International Brigade, p. 57. Phil Gillan, IWMSA 12150/4/4 . F.R. [Frank Ryan], ‘The Great Rally’, in Frank Ryan (ed. ), Book of XV International Brigade, p. 60. John Tisa, Recalling the Good Fight: An autobiography of the Spanish Civil War (South Hadley, Massachusetts: Bergin & Garvey, 1985), pp. 23-4. Arthur H. Landis, The Abraham Lincoln Brigade (New York: The Citadel Press, 1967), pp. 32-3. See Peter Carroll, The Odyssey of the Abraham Lincoln Brigade: Americans in the Spanish Civil War (Stanford: Stanford University Press, 1994), pp. 94-99. John Tisa, Recalling the Good Fight, pp. 42-43. Peter Carroll, Odyssey, p. 99. Marion Merriman and Walter Lerude, American Commander in Spain: Robert Hale Merriman and the Abraham Lincoln Brigade (Reno: University of Nevada Press, 1986), pp. 106-110. Quote from pamphlet ‘Hello Canada’, produced by the Friends of the Mackenzie-Papineau Battalion, 1937 and cited in Michael O’Riordan’s notes ‘Ireland and the Spanish Anti-Fascist Struggle’, November 1966, p. 17, International Brigade Memorial Archive, Marx Memorial Library, London, Box 21 File O’R/1. Anonymous, The Story of the Abraham Lincoln Battalion (New York: Friends of the Abraham Lincoln Brigade, 1938), p. 24, cited in Merriman and Lerude, American Commander, pp. 112-3. 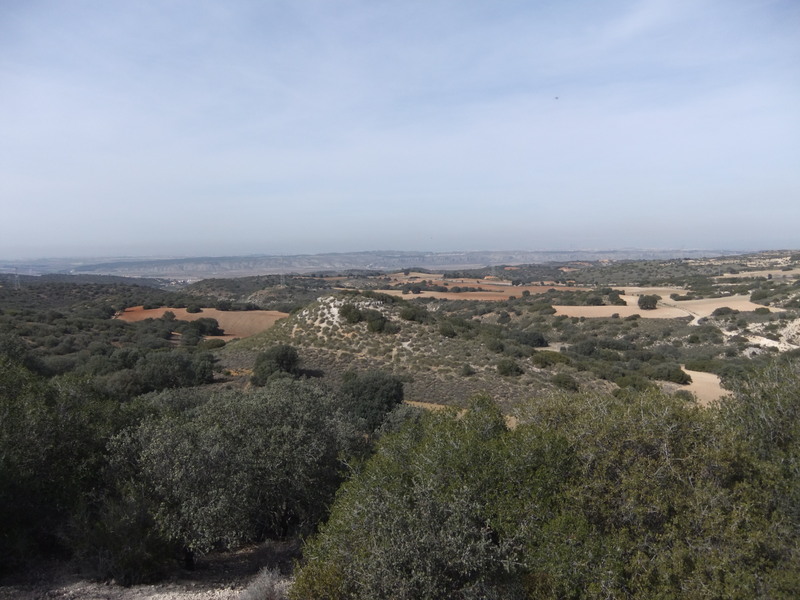 For details of this and other actions of the Lincoln battalion at Jarama, see ‘Interview with Marty Hourihan, Commander of Lincoln Battalion from March 9 to July 4, later second in command of all English speaking battalions in XV Brigade. Villa Paz, Aug. 16, 1937’, RGASPI 545/6/912/41-44.